Praying before a church service in which I preached. About two weeks ago I had a minor accident. No serious injuries, but it shook me up a bit. Most of you know that I’m confined to a wheelchair these days, due to a neuromuscular disorder, “Inclusion Body Myositis.” Well, I have a motorized wheelchair, and it can go pretty fast. I failed to negotiate a steep, sudden upgrade right by our apartment building. I was thrown out of the wheelchair, landing face first on the pavement. An ambulance came. I was taken to the emergency room.and I was checked out thoroughly. I had a concussion, and some big scabs on my face, but nothing serious. But it made me think, and pray. 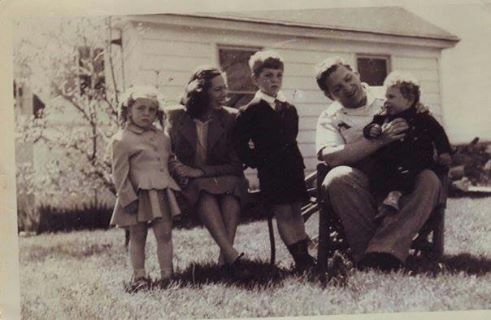 My accident was the day before my 69th birthday, I’m much better now, and I plan to get back to my ministry at the Rockingham County Jail this week, But I’ve had a little time now to think things over, and to pray. Please pray with me, that I may be able to continue this ministry I love so much for years to come. Please pray for some of the men I got to know, as their Pastor and Chaplain, in Maine State Prison, 1987-2006. Some have already passed on, but I know I will see them in Heaven. Some of them have passed on. Some are still in prison. Some have been released, having served 20, 30 years or more. Those who have been released are doing fairly well.They have found good churches, AA or NA meetings that they are comfortable with, and other support groups. The volunteers from Kairos do a wonderful work, helping these men. But they need our prayers. Locked up at the age of 20 or 25, released as they turn 50, many of them have had no chance to develop “social skills” that most of us take for granted. Drugs and alcohol are always a temptation.But many of them that I know just isolate themselves in city apartments, maybe working part time washing dishes. Some seem to feel their lives are already over. Too late to marry, too late to raise a family. Please pray for such men. If they could find a good church, with friendly people that can put them at ease, the Lord could change things for them. I suspect that they feel “everybody knows” sometimes, that it’s written on their forehead that they just got out of prison. Please keep “C” and “D” in your prayers. Both men are regulars in our Wednesday night Bible Study in the jail. Both have come to see me in Clergy visits many times. Both seem bright, reasonable young men. But both are “hold outs,” somehow not ready to accept Jesus as their Savior. Please pray for “J’.” I have gotten to know him pretty well, as this is the second time he has been through the system. He has a stronger commitment to God now, and when he is released in January, he might go to His Mansion Christian Recovery Center. I think this would be great for him. Please pray that he follows through with his application. Please pray for J.G. He told me Thursday, (Jan 18) that he thinks he will be released Friday, Jan.26. He has no plans, and nowhere to go. He says he will go to Manchester, although he doesn’t know anyone there, and he has no place to live there.I sent him some information about Christian programs in Manchester that might take him in until he gets on his feet. J. B. and I have had several long talks. I’ve shared a lot of scripture with him and I believe he has faith, but there’s still so much he doesn’t understand. Please keep him in your prayers. Please pray for S.C. I mentioned him in an earlier Prayer Warriors Newsletter.He recently began serving 6-10 year sentence at New Hampshire State Prison. He was held at Rockingham County Jail while he was awaiting sentencing. S.C. and I had many good talks while he was at the jail. I believe he has made a genuine commitment to the Lord. But the State Prison is a much harder place than the County Jail. It is easy for men to get discouraged there.I’ve written S.C,and sent him a Study Bible and some good Christian books. but I have not heard back from him yet. I”ve also asked for prayer for M.B. before. He was in Maine State Prison when I was Chaplain there. He was a regular part of all our Bible studies, fellowship groups, and worship services. Since his release, He has slipped back into heroin addiction M.B. and his girlfriend told me they had applied to His Mansion, the Christian Recovery Program where my wife and I served on staff But when I called the program, they said they had not seen their applications.They have left another Christian program in Maine. I don’t know where they are now, or what they are doing, but I fear the worst. Please pray for the Lord’s protection over them. Please pray for J .F. We had some great talks in the County Jail. He was reading the Bible diligently, and he enjoyed our Bible Studies He told me he was being sentenced, and he was expecting to be spending the next year or two in the State Prison. He reminded me that I had promised to order a Life Application Study Bible and have it sent to him there. Please pray that I will be able to get that Bible to him soon, along with other Christian Books. Pray that the Holy Spirit will be with him in his new surroundings,despite the negative environment.Pray that he will continue to search the scriptures, going deeper and getting stronger in his faith. Please pray for M. G. He seems very interested in the gospel, but he has a lot of questions. He knows about the 12 Steps of AA, but he thinks it would be too hard to “turn his will and his life over to God.”(Step 3) He feels he would have to be perfect. I showed him.1 John 1:8-2:2: “If we claim to be without sin, we deceive ourselves and the truth is not in us. If we confess our sins, he is faithful and just and will forgive us our sins and purify us from all unrighteousness.” Honestly, humbly confessing our sins in prayer is a far cry from trying to be perfect.Please pray for M.G. to turn his will and his life over to Jesus, fully understanding that he will forgive us and purify us because of all he has already done for us on the cross. Almost all the men I see in the County Jail are addicts. Mostly Heroin, but Meth, Crack, and Alcohol as well. They really want to get “clean and sober,” but the pull of their addictions is also very strong. In jail, without access to drugs and alcohol, many men start reading the Bible, attending chapel services, and participating in Bible studies. Like the Prodigal Son, they “come to their senses.” This is our chance! They are really paying attention now! Please pray for all the Chaplains and Christian volunteers in all our prisons and jails, to be empowered by the Holy Spirit to preach and teach the gospel in such a way that men will hear it and let Jesus come and turn their lives around. Many of the men in the jail are familiar with The Twelve Steps. In my opinion, they are a thinly veiled paraphrase of traditional Christian teaching about redemption, salvation, and sanctification as a process. And there are wonderful books available to us about working the Twelve Steps with Jesus as your higher power. Here are just a few. Please pray that men in jail can get “clean and sober” with Jesus as their “higher power.” And may that just be the beginning of a whole new life, abundant life, for them all. In this Advent season, watching and waiting for our Savior’s birth, but also for his return, we are reminded once again of how many Old Testament Prophecies were fulfilled at Jesus’ birth. To be sure, there are still quite a few that will not be completely fulfilled until he returns. But remembering each Christmas all he has already done for us gives us hope that the best is yet to come. “To us a child is born, to us a son is given, and the government will be on his shoulders. Isaiah 40:9-11; You who bring good news to Zion, go up on a high mountain. See, the Sovereign Lord comes with power, and he rules with a mighty arm. See, his reward is with him, and his recompense accompanies him. and carries them close to his heart; he gently leads those that have young. A bruised reed he will not break and a smoldering wick he will not snuff out. “It is too small a thing for you to to restore the tribes of Jacob and bring back the men of Israel. Isaiah 55:3-5: Give ear and come to me; listen, that you may live. See, I have made him a witness to the peoples, a ruler and commander of the peoples. because of the Lord your God, the Holy One of Israel, for he has endowed you with splendor. to proclaim the year of the Lord’s favor, and to comfort all who mourn . He humbled himself, and laid down his life for us. He came as our Suffering Servant, to atone for our sins. But when he returns, he will be our Conquering King: Revelation 19:11_16: I saw heaven standing open and I saw a white horse, whose rider is called Faithful and True. He is dressed in a robe dipped in blood, and his name is the Word of God. On his robe is written: king of kings and lord of lords. Luke tells us how John the Baptist ” “leaped for joy” in his mother’s womb when Mary, newly pregnant, walked in. Filled with the Spirit, John knew he was in the presence of the Lord. When we come to Jesus, he give us the Spirit within us. We, too, know Jesus is with us. He said, ” I will be with you always.” Please pray for the men in the jail that I work with to come to Jesus and receive the Spirit within them. And pray that they too will “leap for joy” as the Spirit reveals to them that Jesus is always with them. The Bible studies and “Clergy Visits” (Individual Biblical Counseling) I do at the Rockingham County Jail are my greatest joy and blessing . The men who come to our Bible studies seem to be genuinely searching for something. Maybe, I tell them, what they are searching for is Jesus. When we seek him, we find that he in turn, is seeking us. Jesus said he came” To seek and save the lost.”(Luke 19:10) I love to teach about salvation, about how to grow as a Christian, what Jesus offers in a covenant relationship with him, and how he can change them, transform them, heal them, and sanctify them. “If anyone is in Christ, he is a new creation.”( 2 Corinthians 5:17) Almost all the men I see are Heroin addicts. 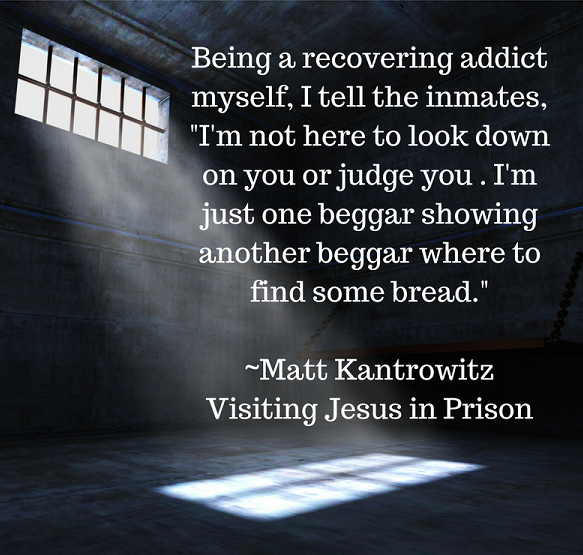 They all want to get “clean and sober.” But Jesus offers so much more. They have tried to fill that empty place inside with drugs..But maybe that craving is really a “hunger and thirst for righteousness.” Please pray for them to give their lives to Jesus, to be filled with the Holy Spirit, and to leap for joy whenever they are in his presence. C/O The Church at Prison, Inc.
You can email me for more information at mmkantrowitz@gmail.com. All donations are tax deductible. I made this video for the New Hampshire Bible Society about two years ago. Some of the details have changed: I now minister in only one county jail in New Hampshire, but I spend a good amount of time there, teaching Bible studies and visiting inmates one-on-one. I still give out a lot of Life Recovery Bibles and other Christian literature. What a blessing it is to get to know these men, to hear their stories, to relate to them as someone who cares and understands, and to share with them good news of the hope and healing they can find in Christ. I was Protestant Chaplain in Maine State Prison for 18 years. Many of the men shown here involved in Hospice were good friends of mine.They were part of the Christian Fellowship I had the privilege to serve behind the walls. And yes, some men I was close to have died in prison. It’s a comfort and a blessing to know they did not die alone. Like the Hospice Program, the K-9 program in Maine State Program is a great way for “hardened criminals” in Maine State Prison to use their prison time to do something positive, constructive, and even loving. God spoke though the Prophet Ezekiel about a time to come when he would take away our hearts of stone and give us a heart of flesh. (Ezekiel 36:24-27) It’s a great blessing to know that this is happening through these programs at Maine State Prison. Watch a news story about the K9 Corrections program here.